Could the iPhone Replace Star Trek's Tricorder? Growing up, I loved Star Trek. It's easy to see why people want to recreate the experience with today's devices. There is a guy bringing Star Trek to the world of Macs starting with LCARS on the desktop (above). 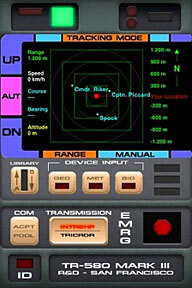 If you prefer, you could buy a tricorder simulator, TR-580 Mark III for the iPhone. The question is why live a fantasy? The iPhone is better than a tricorder. It is the tricorder, communicator, and universal translator all rolled into one. Sure, you could claim that the tricorder was an advanced sensing device, but what it really did was provide answers to the hundreds of tough situations the crew found itself in. What would the crew of the Enterprise do if they were given an iPhone instead of a tricorder ? Could Dr. McCoy use it in the infirmary? Yes, there is VR-Render 0.7 for viewing medical images. Or how about A to Z Drug Facts or a program to help understand lab results, Normal Lab Values. What about First Officer Spock? He could take a primitive look at how 21-century scientists viewed Quantum Mechanical Atomic Orbitals. If the ship went through a wormhole and Spock had to find their new location, he could whip out Starmap to help pinpoint where they are. Is there anything for Chief Engineer Scott to use? For starters there is cadTouch, which will open schematics of the ship for troubleshooting. If he needs to run some calculations or pull up a formula, he can open Formula Pro. And when he has to deal with a turbulent atmosphere on a new planet, he can use a fluid dynamics application. Least we forget, it was always Captain Kirk asking for crazy things to be accomplished by his crew and their trusty tricorders. He could ask that controls for the ship be rerouted to the iPhone so it could be controlled by an application like V-Cockpit GPS. 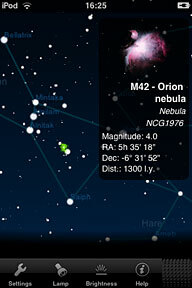 If that isn't good enough, he could find the lost ensign by using iHound to hunt down the ensign's location. What got me thinking about this was a Newsweek article on the military using the iPod touch and iPhone. We are seeing the iPhone being turned into a solution for situations in real life military conditions from face recognition to ballistic calculations. The iPhone can easily steal the title of "do everything device" that the tricorder was.